So I was checking out some tutorials on Pinterest to get some cardmaking mojo, and saw a tutorial on ways to use chalk. This lady was using Stampin Up chalks....I actually have a container of Stampin Up chalks (Stampin Pastels) I bought ages ago when I used to go to their home parties. I had hardly ever used them, in fact it's been so long ago, I do not remember them ever showing us this technique. Anyway...you stamp an image with Versamark on your card stock and color it with chalks using sponge daubers. 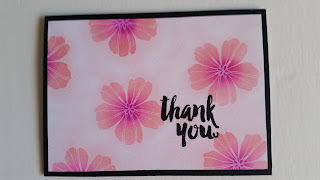 So I stamped this flower from the Color Splash Stamp & Stencil set by Recollections all over with Versamark & used three pink colors of chalk from Stampin Up to daub the color on. I believe the 3 colors are Pink, Rose and Magenta. The sentiment is from the same set as the flower. I think it turned out awesome & I'm going to have to use this technique again in future cards! The colors are so much prettier in person! That is so pretty, love the colours and love the way the sentiment pops out. Thanks for joining us at Stamping Sensations this month. this is so pretty in pink and i love the bold sentiment! sounds like a fun technique! thank you so much for playing along with us this month at penny black and more! What a beautiful creation in such lovely colours, thank you so much for sharing with us at Stamping Sensations and Penny Black and More challenges. Love the soft colours that using chalk has made, beautiful floral card. Lovely card with beautiful soft colours. Wonderful card, the flowers look so pretty. Wow thats really pretty! I've never tried painting with chalks but I have to give it a go now. Good thing you took out those chalks again! 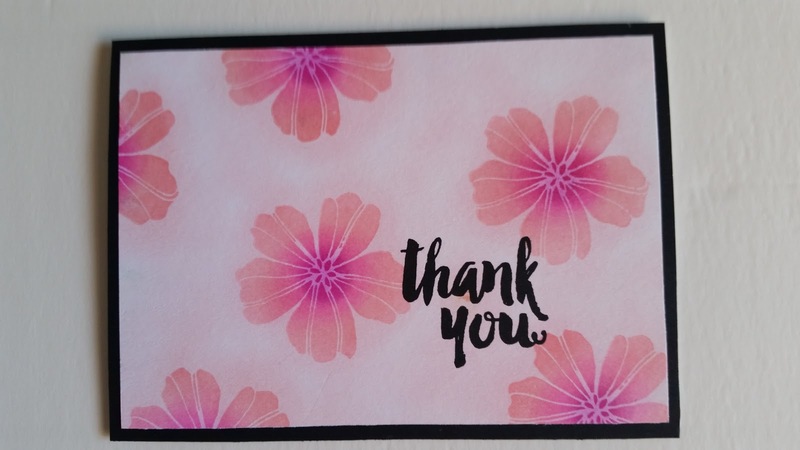 A very pretty CAS card - I do love the different shades of pink in each flower. Thanks for sharing at In The Pink - hope we see you again soon! very pretty card! great technique! I forgot about that one! thank you so much for sharing with us at Quick Quotes this month! good luck! Beautiful Card. Thank you joining us over at Morgan's ArtWorld for our Add 3 of Something. Love the look of chalk! Thanks for joining us at Quick Quotes! Beautiful card Patty! Love the soft color palette. Thank you for joining our Great Impressions Challenge this month. Absolutely beautiful! Thanks for playing along with us over at Quick Quotes - and Congrats on the win!